After a very busy shopping day in Corso Genova, or just in case you'd like to round off the evening started by watching a nice movie at the Orfeo pictures or even at the end of a tough swimming session at the nearby Solari Swimming Pool … well, whenever you chance to feel peckish after the frantic activities you've been devoting yourself to - and to realise you don't know where to go or how to appease your hunger ... this is the right place for you! Its name is LANGOSTERIA 10-Bistrot & Bottega and it is located in Viale Coni Zugna, at the corner with via Privata Bobbio: a very cute venue where fish-eaters will be treated to the utmost. 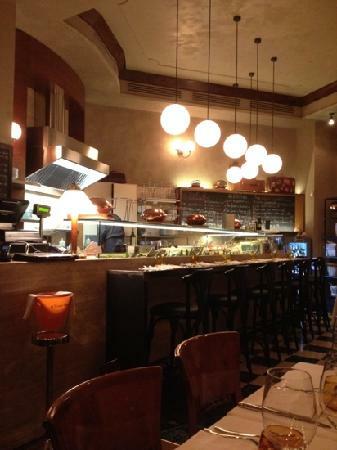 The ambience is in the Paris-style, the Neapolitan food is high level, fish and shellfish come in great deals. Could you ever wish more? The refined and glamorous furniture is perfectly matched with the taste of the dishes on tap, and this is all blended by the nice service staff (indeed hard to be found in today's irritating Milan) and by delicious wines. Just in case you are going to wow your evening fellow, your female friend for a quick aperitif, or your fiancé for a tête à tête dinner, or even your grumpy boss for an informal business dinner where you'll try to mellow him … just reserve a table there and you won't regret it! Questa foto di Langosteria 10 Bistrot e Bottega è offerta da TripAdvisor.